Born in Clay County, Alabama, Hugo L. Black (1886-1971) graduated in 1906 from the University of Alabama School of Law. Settling in Birmingham, he soon developed a reputation as a brilliant plaintiff's lawyer with progressive leanings. Following military service during the first World War, he resumed his legal and political careers. Like many aspiring politicians, he joined the Klu Klux Klan; this membership was a factor in Justice Black’s rise to prominence. Yet, mean-spiritedness had no place in his makeup, and he did not remain in the Klan. Elected to the United States Senate in 1926, Black was a reformist senator and a leading New Dealer. In 1937, President Franklin D. Roosevelt nominated him to the United States Supreme Court. Black was confirmed despite a furor over his former association with the Klan. He served on the Supreme Court for thirty-four years, promoting the First Amendment, working to make the bill of rights applicable to the states, and supporting the landmark civil rights decisions of the Warren Court. For much of his life, Justice Black engaged in a program of self-education. As senator and justice, he scoured bookshops for the works of his favorite authors and accumulated an impressive number of books on law, history, philosophy, and other topics. He underlined and annotated many of his books, making them a unique source of insight into his thoughts and opinions. At the time of Justice Black's death, officials of the Law School already had expressed an interested in acquiring his library. As early as 1972, University and Law School officials were planning to recreate Justice Black's Alexandria, Virginia study. Subsequently, Mrs. Elizabeth Black donated furnishings and some books; however, she gave the bulk of the collection to the United States Supreme Court Library. 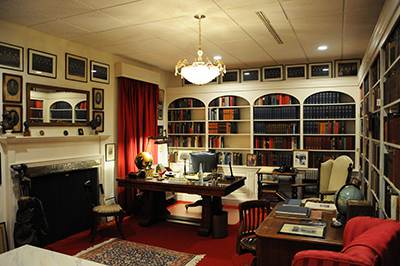 The restored study was dedicated in May 1978 during ceremonies that marked the opening of the University of Alabama Law Center. In 1983, with Mrs. Black's consent, the Supreme Court Library transferred its Hugo Black collection to the University of Alabama Bounds Law Library. The collection consists of more than one thousand volumes.